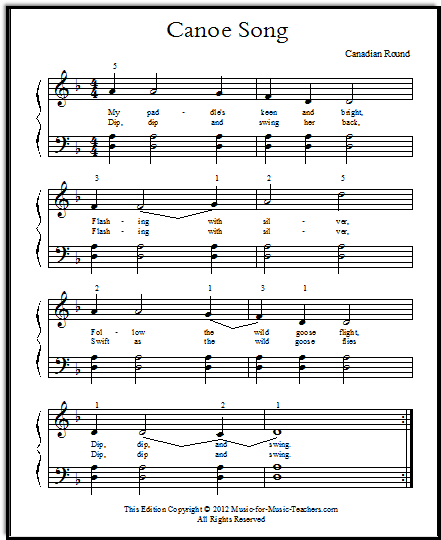 Simple Piano Sheet Music "Canoe Song", a Canadian Round, FREE! This simple piano sheet music, Canoe Song is just right for students who are beginning to tuck fingers under in scales. I love this energetic song with its unpredictable rhythm. Like Indian Dance, it allows students to really pound the piano if they are in the mood! Not that pouding is something you should encourage, however, young students frequently DO enjoy pounding, as we all know. Canoe Song is also a round for singing! But even without singing in round fashion, the melody is captivating, and you and your student will enjoy leaning into the half notes as you sing it together. 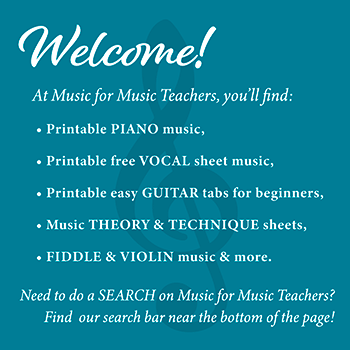 This easy piano sheet music for beginners will probably remind your students of Indian Dance, but the melody requires a much higher skill level. Don't give it to them until they really understand how to do a simple C scale, otherwise they will substitute other fingers to get up high and take 10 times longer to learn the song! Really! The easy left-hand chords which follow the rhythm of the right hand allow concentration on the twists and turns of the melody. The syncopated feeling of this melody poses an additional challenge for beginners, many of whom are extremely resistant to counting aloud! For them, it will help to sing the words of the song, and also to clap their hands, or tap their lap as they count. Separate the timing issue from the note-playing for beginner students just learning the "tucking-under" technique. I set the rhythm to 4/4 so I wouldn't have to use eighth notes, to make it easy to count. What a fabulous website! I've been a keen amateur piano player since I first learnt 56 years ago at the age of 8. I now have a three year old granddaughter and am hoping fervently that she'll want to learn - at which point I'll teach her. This is just the kind of resource I'll need to make it comprehensible. Thank you very much.